September 05, 2018 at 9:18 pm. Head coach Hue Jackson of the Cleveland Browns has vowed to make his team and one of the oldest, most bitter rivalries in the NFL more competitive, and he already has had a little success at the latter heading into Sunday’s opener against the visiting Pittsburgh Steelers at 1 p.m. (ET) at FirstEnergy Stadium. Of course, close doesn’t mean a thing in the NFL and Cleveland is 1-15 and 0-16 the last two seasons, which is why the Browns have 31 players on their roster who weren’t there last year. That has led to some new optimism, although wide receiver Jarvis Landry’s claim that, “If we get everyone playing to their potential, we can win the Super Bowl this year,” seems to be going a little overboard. 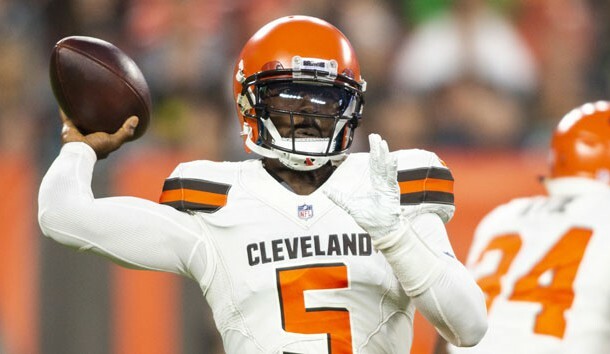 Some of Cleveland’s optimism stems from the acquisition of quarterback Tyrod Taylor, who last season helped end a 17-year playoff drought in Buffalo. He is confident, but more restrained than Landry. “Yes, I have seen those steps (that the Bills made last year in the Browns), but it’s also still early,” Taylor said. “Right now we’re molding and shaping a team to be able to go out this year and do those things. But I think this team is headed in the right direction, for sure. Taylor might be on a short leash if things don’t start well, because No. 1 overall pick Baker Mayfield, the Heisman Trophy winner from Oklahoma, is his backup. Roethlisberger, who has a 21-2 record in starts against the Browns, passed for 4,251 yards and 28 touchdowns last season, but it appears the Steelers will be without running back Le’Veon Bell. Preparing for the revamped Browns might pose a problem for the Steelers, and there is the added element of Todd Haley being the Browns’ new offensive coordinator after holding the same job with the Steelers for the last six years. One concern for the Browns’ offense is that Joel Bitonio is making his first start at left tackle after four seasons at left guard and must keep linebacker T.J. Watt off Taylor’s back while protecting his blind side. When you add it all up, even though the Browns probably can’t help but be better, the Steelers figure to improve on their lead in the all-time series.